I was there. 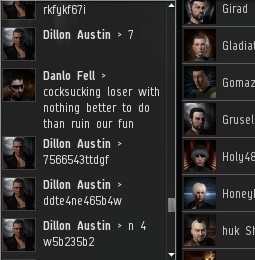 Kino local was rocked by one of the worst miner meltdowns I have witnessed in my entire bumping career. So furious was the deluge of miner tears that the post must be split into parts. In the future, I will explain the context and recount the events that led up to the meltdown, and what happened after the events of this post. Consider this a preview. Now let's dive right in and find how what happens when highsec miners stop being AFK... and start getting real. Reader discretion is advised. We begin in medias res. 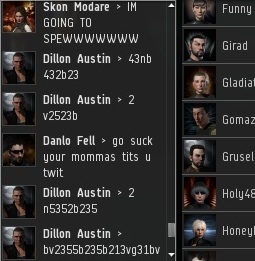 Dillon Austin, a highsec miner and self-proclaimed enemy of the New Order, has lost all reason, and begins spamming local with random letters and numbers. 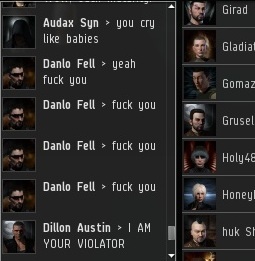 Danlo Fell, a miner with a political stance similar to Dillon's, makes his own feelings known. What has driven these "peaceful" miners to such a state? The two visions of highsec set in contrast: The peace and civilization of the New Order, and the barbarism of the rebels. 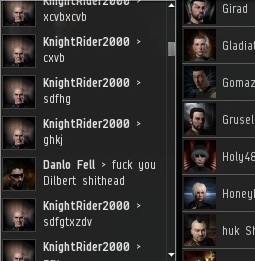 KnightRider2000, another highsec miner who styles himself a leader of the opposition, also gives in to madness. Danlo finally articulates his feelings in a way that provides a clue: He's angry with Agent Dilbert Jenkins. But why? Dillon regains his speech. He offers an ecstatic confession of his violations of the Code. Dilbert offers the miners a way out. They do not take it. 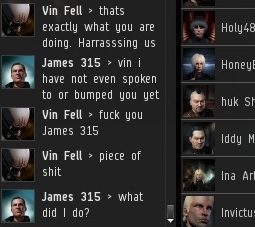 Yet another highsec miner, Vin Fell, joins the fray. 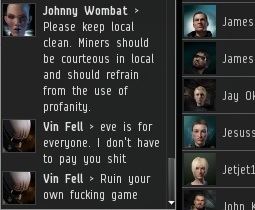 Agent Johnny Wombat is on hand to quote the Code provision against profanity in local. But it is of no use. In reckless disregard of the Code provision against petitions, Vin claims to take the high road. Agent Steve the Pirate is no stranger to salty language, but even he is taken aback by these swarthy dogs. At last, I must speak. Vin's outburst came out of nowhere; as soon as he entered local, the first thing he did was lose his marbles. What was the cause of this system-wide meltdown--and could the New Order regain control before all were drawn into the vortex of madness? What bothers me is that you people don't seem to realise or care what effect you have on the people you grief. This should be a clear indication of what your actions lead to. You should be ashamed that you can foster this sort of behaviour. I hope you're not seriously blaming their behavior on us, considering that kind of local spamming and profanity is against the Code. But the real issue is, you need to look at the bigger picture and consider the entire range of effects the New Order has, not just the negative. You also need to think long-term. I know for a fact there are people who cursed and despised us, and even petitioned us, but later turned over a new leaf and joined the New Order themselves. I also know for a fact that many of our biggest supporters are miners themselves. Miners are much better off with us than without us. If you are honesty driven to this kind of incoherent verbal violence because of an internet space ship game, perhaps you should stop playing and seek counseling. 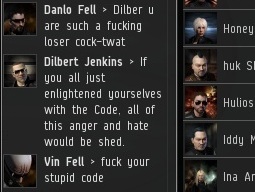 Interesting that you don't see this level of rage when a nullsec alliance loses an entire fleet of valuable ships. 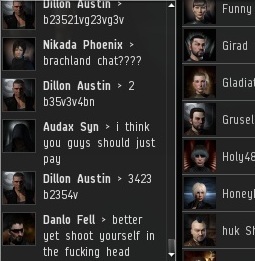 Miners were just getting bumped--or in some cases, not even that--at a maximum cost of 10 million isk. What bothers me is that this "miner" is drawn to blame the victims of these profanity-laced attacks for inducing their anger. In a way, it is not that different than beating ones spouse and then blaming the spouse for making them angry. May we all learn to inspire others to follow The Code and reprehend these so-called "miners" from taking out their violent aggression on innocent spouses and children. I agree. Many broken families could be put back together if we succeed in reforming these angry miners! Wait a minute wait a minute wait a minute. I was just on this cesspool of a website because I deplore the Code and wanted to see how mad you cretins really are, but I can't believe you just did that. You just took the serious, awful, terrible act of spousal abuse and use it as a point in your stupid mission in a video game? How low can you people sink? Abusing one's spouse is a serious thing, you can't just liken it to people you bother getting angry in a video game? Have you no shame? Or are you the most heartless of all trolls? James, are you even married? Or can you just make poor spousal abuse metaphors because you are alone with no one to care about? Enraging people in a video game is annoying, but this is just sick. The only person here using spousal abuse to make your point is you, whoever you are. The Saviour was agreeing that taking real action to end spousal abuse was a good thing; while all you are doing is ranting and beating your chest, using spousal abuse to show how bad you think the Code is. Sickening. I agree, with Burt, Anonymous's obvious anger makes me wonder if he's even stopped beating his wife yet? It seems obvious that he hasn't, as she would have posted by now if he let her near a computer. Now that this obvious truth has been pointed out, I wouldn't be surprised if he posts next pretending to be his wife, or pretending that he was a woman all along. Sorry, that train has left the station, wife-beater. To be fair, and this is the same anon as before, I don't have a wife as I'm not at that age yet for that kind of relationship. But dragging a serious crime into a game such as this, and doing so in such a "you are mad so you hit your wife/husband (it goes both ways mind you), and it's because you are lesser than I" persona is not very funny. And I'm not angry Sheriff, I'm appalled. Anger isn't the only emotion someone who is against this cancer of an idea can feel. If you think I'm angry, you're harvesting the wrong kind of tears that you need to survive. Also, don't make the assumption I beat my wife, or that I even have one. You don't know me, alright? And if I was in face married, I'd be hurt if you thought I would ever abuse a women. That is arrogant thinking on your part, to think you know who abuses women or not just because you play a game a certain way. Your online persona is distasteful. To be fair, I'd rather get bitten by a poisonous snake then listen to your take on fairness. This is just as I thought, you'd deny these obvious truths with predictable fabrications. Basically, you've admitted that you haven't stopped beating your wife, but you think it's ok and not relevant here because you contend there's absolutely no connection between real life abuse and how people play this game? Wrong, dead wrong. Both of those things are all about people's character and moral fibre. They are intrinsically connected. Distasteful is right, but it doesn't go far enough. Have you read the bible? Reread Matthew 7:3 then change your life, sinner. Or I'll be coming for you. "could the New Order regain control before all were drawn into the vortex of madness?" - You're not a very good tease, since the Saviour of Hisec is involved we already know that there's a happy ending to this story. Excellent point! But you know me, I need to add the flavor text. Could we get more internet lawyering? It's my fave. Vin Fell was in Aakari for a while yet he never said anything against me or any other agents there. I guess he unleashed all his rage on you. Steve the Pirate be epicly addin' to ye crew, mate ! Smooth sailin' ahead, arrrrrrr ! I'm laughing so hard I'm in tears. 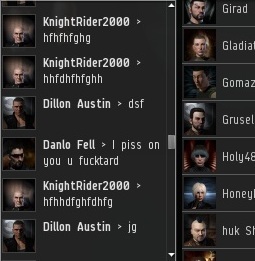 Reading those chat logs is priceless.